It was “Tutor” Scherer who launched the first known floating casino off the Southern California coast. He also had a large bookmaking operation and was affiliated with gambling clubs in Palm Springs as well as Hollywood’s Clover Club and the Airport Gardens in Glendale. Like fellow Spring Street Gang gamblers Guy McAfee and “Farmer” Page, he ended up in Las Vegas, where late in life he blossomed into a poet. Born in Bristol, Wisconsin in 1885 to prominent surgeon Luther D. Scherer and his wife Mary Bacon, Luther Bacon “Tutor” Scherer grew up in Los Angeles where he attended the upscale Harvard Military Academy (1). There is much speculation today about the origin of the nickname “Tutor.” Scherer maintained that he acquired it while playing baseball as a kid, the result of some overly enthusiastic third base coaching. As of 1918, Scherer was working as a camera man for Vitagraph Pictures in Hollywood, according to his WWI draft registration card, and had married a young stage and screen actress, Myrtle Webb. By 1925, he was gambling in the Palm Springs Hotel. In Los Angeles, he had an interested in the Western Athletic Club upstairs at 534½ S. Spring Street, until it was raided by LAPD vice officers in January 1925 (2). His other ventures included the Ship Café at Venice and the Airport Gardens in Glendale. 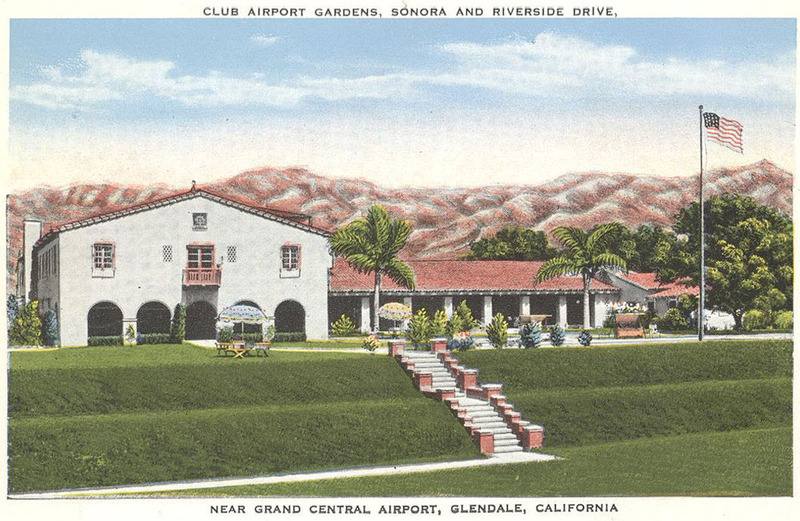 Club Airport Gardens at the Grand Central Airport in Glendale, renamed the Club Continental in 1935 (and under the same management as the Clover Club in Hollywood). In 1939 it was converted to barracks. 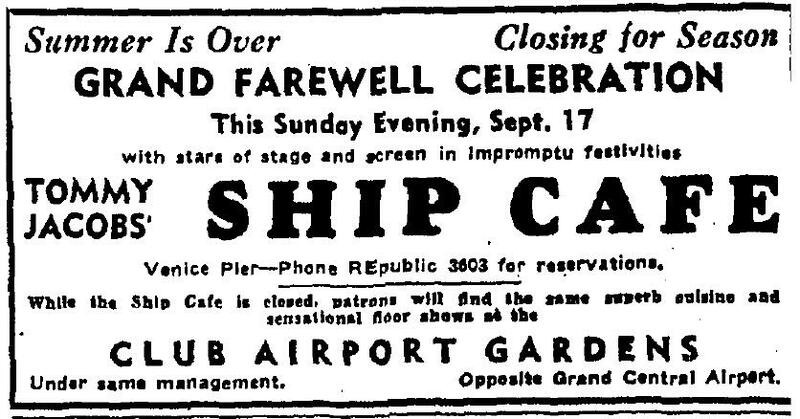 The notorious Ship Café in Venice, managed by Tommy Jacobs along with the Airport Gardens in Glendale. 9-16-1933. In the summer of 1927, the first known gambling ship prototype was launched off the coast of California. A fishing barge, known only as Barge C-1, appeared off the coast between Venice and Santa Monica. Deputy Sheriffs raided the vessel after determining that it was in fact a “floating gambling den” and promptly shut it down. Tutor came out of the shadows to identify himself as the owner, and sued L.A. County D.A. 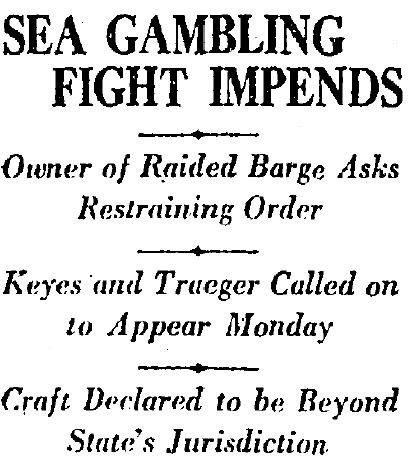 Asa Keyes and Sheriff Traeger for the raid, arguing that the ship, anchored 3½ miles offshore, was outside the jurisdiction of their jurisdiction. It was an argument that would play out in court multiple times for years to come. In the midst of his gambling boat fight, Scherer also experienced a personal tragedy when his wife died following a brief illness, leaving him a widower with a small daughter. Tutor ultimately lost the battle over Barge C-1 but it wasn’t his last gambling ship venture. 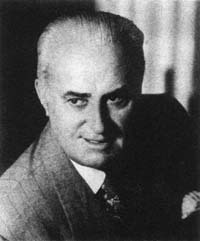 In December 1932 he (as “Tutti” Scherer) was revealed to be a partner in the Rose Isle. 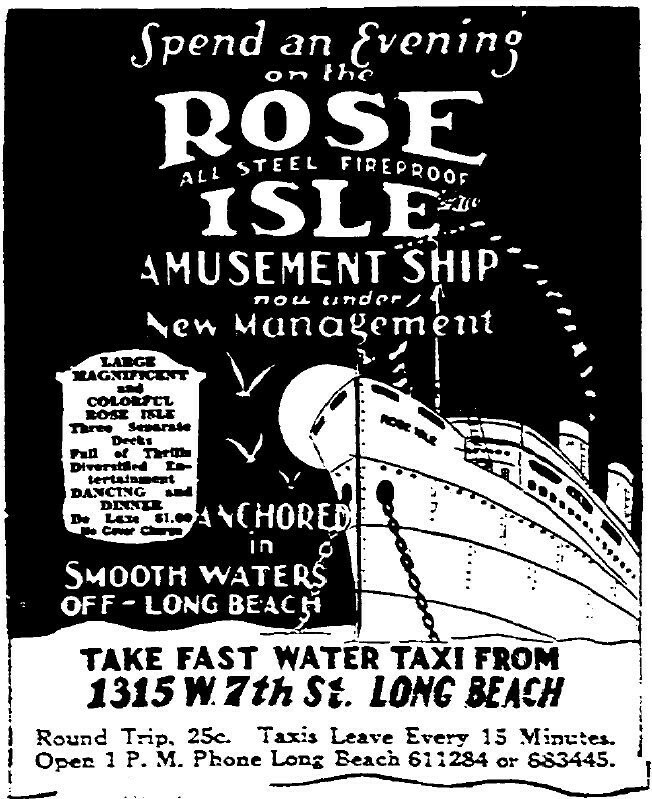 The Rose Isle had been launched in 1930, with Scherer’s associate Farmer Page prominently identified as one of a part owner along with Tommy Jacobs, manager of the Ship Café and Airport Gardens. Later that year the Rose Isle was mixed up in the botched kidnapping of bookmaker-gambler Zeke Caress. In July 1932, with hundreds of thousands of tourists pouring into Los Angeles for the summer Olympic Games, a dealer aboard the ship was found dead, believed to have been murdered by one of the bouncers. “Under new management” The waters off Long beach may have been smooth, but it was rough sailing for the Rose Isle after being mixed up in yet another crime. Tutor was revealed as one of the owners in the investigation into the death. 8-10-1932. Scherer also ran a bookmaking operations in the city, said to be one of the largest in the city, out of 326 S. Spring Street, the old Jim Jeffries bar, now owned by Zeke Caress. Tutor Scherer proudly advertising real beer at 326 S. Spring Street, April 7, 1933, the day it became legally available in Los Angeles for the first time since 1917. Later that summer, State Attorney General Earl Warren, who was engaged in shutting down the gambling ships that still operated off the Southern California coast, promised to continue the effort on dry land, noting that the “big shot” gamblers would be his primary focus. In December 1940, the new D.A. John F. Dockweiler also warned gamblers to get lost or else. Asked specifically whether his edict applied to “reputed gambling figures” like Tutor Scherer, Dockweiler replied: “All these so-called big shots and their satellites must decamp and get out of town as they are to be treated as any other if they violate the law.” Even gambling-friendly Palm Springs, where Tutor still had many holdings, was cracking down on its illegal casinos. Coincidentally or not, it was around this time that Tutor turned up in Las Vegas. 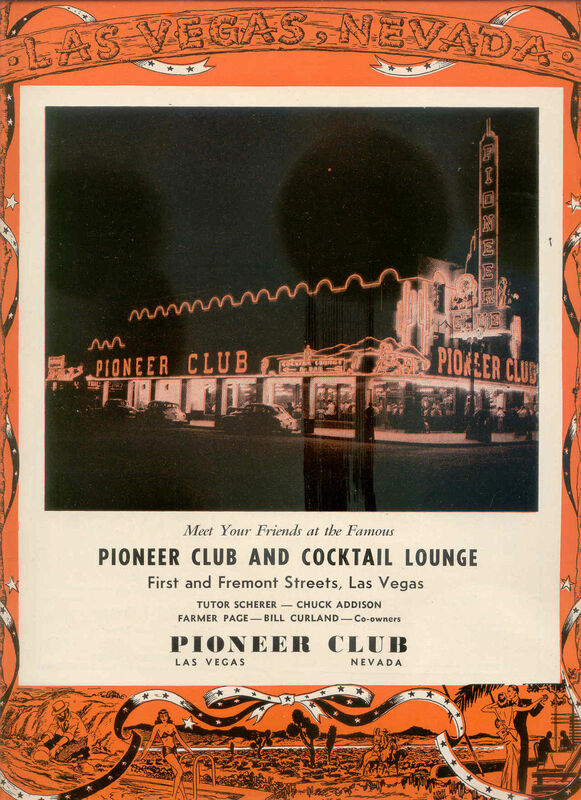 In April 1942 Scherer and fellow L.A. gamblers Farmer Page, Bill Curland, and Chuck Addison opened the Pioneer Club in a the former Beckley’s store at the southwest corner First & Fremont in Las Vegas Along with Guy McAfee’s Frontier Club, it was one of the major downtown casinos during the war years. Scherer went on to invest in other Las Vegas casinos. In 1948 with McAfee, Page and others, he became a co-owner of the casino at the El Rancho Vegas on Highway 91, the first hotel on what McAfee later nicknamed “the Strip.” A multi-millionaire from his real estate and casino investments, he later had an interest in the Las Vegas Club, the Nevada Club, the Lucky Strike Club, the Thunderbird Hotel, the Sahara Hotel and The Mint casino. It was poolside at the El Rancho that the 63-year old Scherer took up poetry- on a bet, of course. 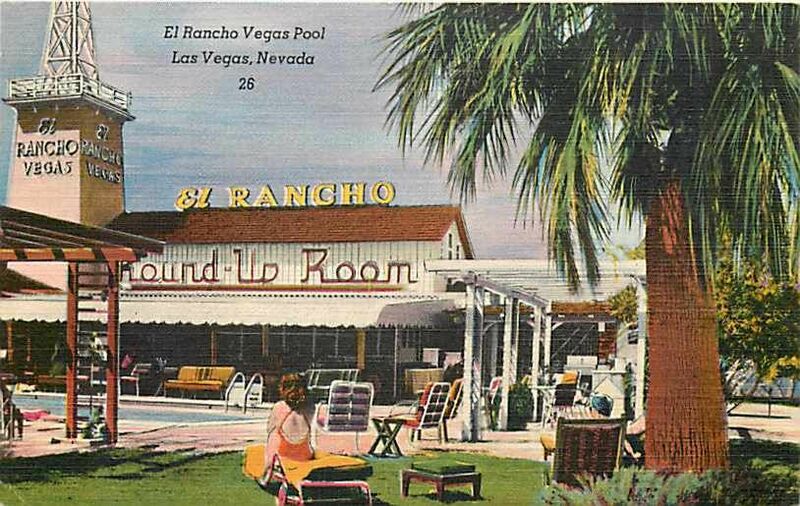 His efforts appeared regularly in the Magazine Las Vegas, and in 1956 Scherer assembled his favorites into a privately-published book, Reminiscing in Rhyme. Governor Charles Russell named him Poet Laureate of Nevada in 1950. Try to grind my losings back. Scherer tended to keep a low-profile in his business dealings, but in his private life this was not always the case. 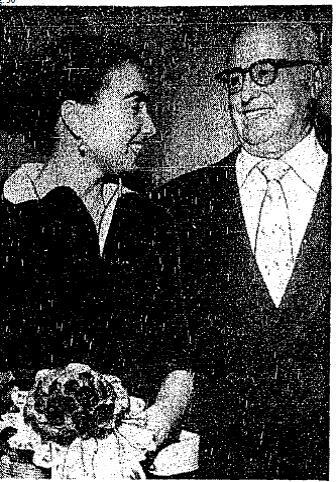 In July 1951, he married Laveeda (also spelled La Veeda) Varley, a 27-year-old El Rancho Vegas cocktail waitress before 4,000 guests in a $25,000 ceremony considered the social event of the season. The marriage was brief and stormy. Just a few weeks shy of the couple’s first anniversary, Laveeda “accidentally” shot Tutor in the leg after allegedly catching him with another woman. They quietly divorced at the end of 1952, with Laveeda giving birth to a daughter early in the New Year. 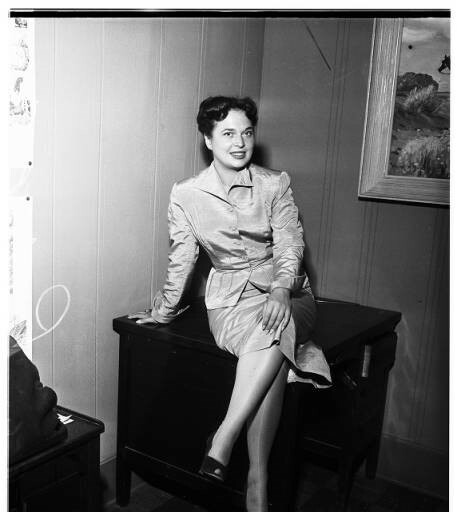 Scherer’s fiancé, Laveeda M. Varley, posing for publicity pictures, 1951. UCLA digital. Scherer was back in the news in 1953, when in March, his former mother-in-law, Mabel Monahan, was murdered in an apparent burglary gone wrong. Scherer and Iris Monahan had been divorced for two years, both having since remarried. Scherer was questioned while vacationing in Palm Springs, but could offer no clues. It was later revealed that the criminal gang had targeted the Monahan home based on a rumor, false as it turned out, that the Scherer had stashed $100k there (3). On June 27, 1953, Scherer married again for the final time, to Judy Cauley Rodil, a 24-year-old former cocktail waitress, in the penthouse of the Sahara Hotel, after paying for the license with a $5 chip. They had a son, Lord “Lucky” Bacon, born in 1954. A stroke in the summer of 1957 left Scherer partially paralyzed. He died on Aug 19, 1957, leaving an estate worth in excess of $1 million. Accounts of Tutor’s early biographical history appeared in Viva Vegas (1953) by Hollywood actor-turned Las Vegas lawyer Paul Ralli and in Magazine Las Vegas publisher Tom Magovan’s introduction to Scherer’s Reminiscing in Rhyme. (1) Like many underworld figures, his birth year fluctuated from record to record. 1885 is listed on his death notice. The biographical sketch in Reminiscing in Rhyme also records it as 1885. His WWI registration lists it as 1887. For WWII he’d added seven years, listing it as 1880. His burial marker lists it as 1879. His Los Angeles Times obituary, which contains other errors, lists his age at death as 77. (2) In February 1925 the space reopened as the Manhattan Gym, better known as Dempsey’s. (3) In late March 1953, Burbank police detained Baxter Shorter and 4 other men in connection with the Monahan case. Shorter confessed all. Another of the men, who had declined to participate in the plot, told police about the reputed $100k motive. The men were later released, including Shorter. In April 1953, he was kidnapped from his home, 112 N. Flower St., Bunker Hill; his body was never found. In June, three men and a woman, Jack Santo, Emmitt Perkins, John True and Barbara Graham, were charged with the murder. True turned State’s evidence in exchange for immunity. Santos, Perkins and Graham were found guilty on September 22, 1953 and executed at San Quentin June 3, 1955. Subsequent to the Monahan verdict, Santos and Perkins were also found guilty of the December 1951 robbery-murder of a Nevada City, Calif. gold dealer and the October 1952 robbery-murder of a man and three young children. Graham’s story was depicted in the highly fictionalized biopic I Want To Live! (1958). “Tutor” Scherer launched the first known floating casino off the Southern California coast. He had a large bookmaking operation and was affiliated with gambling clubs in Palm Springs as well as Hollywood’s Clover Club and the Airport Gardens in Glendale. Like fellow Spring Street Gang gamblers Guy McAfee and “Farmer” Page, he ended up in Las Vegas, where late in life he blossomed into a poet. There is much speculation today about the origin of the nickname “Tutor.” Scherer maintained that he acquired it while playing baseball as a kid and got a little too enthusiastic about his third base coaching. 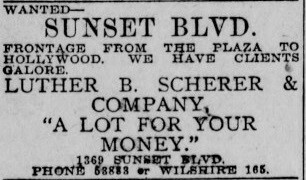 As of 1918, Scherer was working as a camera man for Vitagraph Pictures in Hollywood, according to his WWI draft registration card. He married a young stage and screen actress, Myrtle Webb. By 1925, he ran gambling in the Palm Springs Hotel. In Los Angeles he was also interested in the Western Athletic Club upstairs at 534½ S. Spring Street, which was raided by LAPD vice officers in January 1925 (2), the Ship Café at Venice and the Airport Gardens in Glendale. In the midst of his gambling boat fight, Scherer also experienced a personal tragedy when his wife Myrtle died following a brief illness, leaving him a widower with a small daughter. Tutor ultimately lost the battle over Barge C-1 but it wasn’t his last gambling ship venture. In December 1932 he was revealed to be a partner in the ship Rose Isle. The Rose Isle was launched in 1930, with Scherer’s associate Farmer Page prominently identified as one of a part owner along with Tommy Jacobs, manager of the Ship Café and Airport Gardens. Later that year the Rose Isle was mixed up in the botched kidnapping of bookmaker-gambler Zeke Caress. In July 1932, with hundreds of thousands of tourists pouring into Los Angeles for the summer Olympic Games, a dealer aboard the ship was found dead, believed to have been murdered by one of the bouncers. 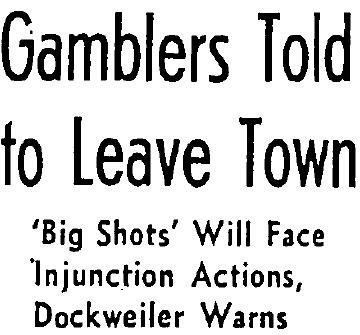 Later that summer, State Attorney General Earl Warren, who was engaged in shutting down the gambling ships that still operated off the Southern California coast, promised to continue the effort on dry land, noting that the “big shot” gamblers would be his primary focus. In December 1940, the new L.A. County D.A. John F. Dockweiler also warned gamblers to get lost or else. Asked specifically whether his edict applied to “reputed gambling figures” like Tutor Scherer, Dockweiler replied: “All these so-called big shots and their satellites must decamp and get out of town as they are to be treated as any other if they violate the law.” Even gambling-friendly Palm Springs, where Tutor still had many holdings, was cracking down on its illegal casinos. Coincidentally or not, it was around this time that Tutor turned up in Las Vegas. 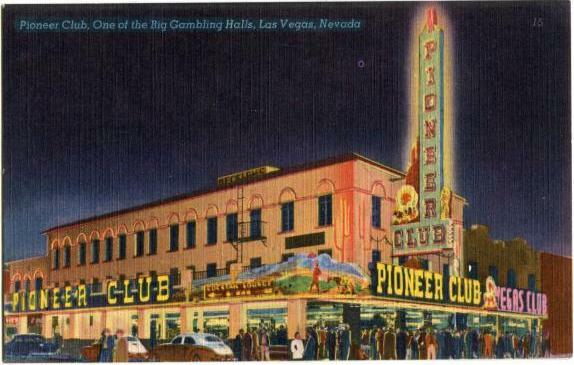 Postcard view of the Pioneer Club in the 1940s, before the addition of the famous “Vegas Vic” sign. 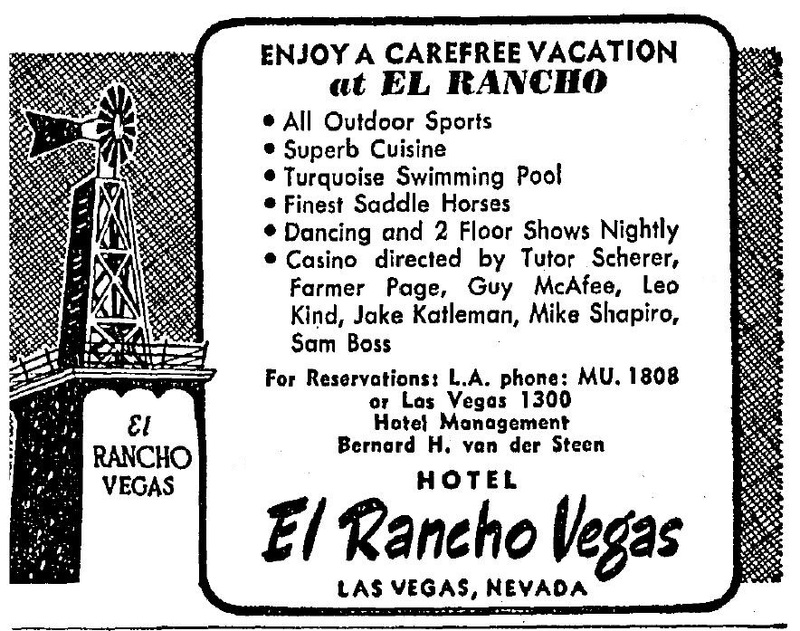 It was poolside at the El Rancho that the 63-year old, Scherer took up poetry- on a bet, of course. His efforts appeared regularly in the Magazine Las Vegas, and in 1956 Scherer assembled his favorites into a privately-published book, Reminiscing in Rhyme. Governor Charles Russell named him Poet Laureate of Nevada in 1950. Scherer tended to keep a low-profile in his business dealings, but in his private life this was not always the case. In July 1951, he married Laveeda (also spelled La Veeda) Varley, a 27-year-old El Rancho Vegas cocktail waitress before 4,000 guests in a $25,000 ceremony considered the social event of the season. Tutor Scherer’s fiancé, Laveeda M. Varley, posing for publicity pictures, 1951. UCLA digital. Tutor and Laveeda in happier times, before she shot him. The marriage was brief and stormy. Just a few weeks shy of the couple’s first anniversary, Laveeda “accidentally” shot Tutor in the leg after allegedly catching him with another woman. They quietly divorced at the end of 1952, with Laveeda giving birth to a daughter early in the New Year.